How do we define the Midwest? Do we identify the region by lines on a map, environmental features, or the shared values of residents? John Hildebrand believes the heart of the Midwest can be found in even smaller details. “Time and place might be the coordinates, the latitude and longitude, by which we chart our position in the world,” he writes, “but things are what we remember.” With humor and admiration, Hildebrand focuses on these things—the “solid, physical detail around which the intangible clings”— to conjure a sense of the Midwest in his newest collection of essays: The Heart of Things: A Midwestern Almanac. Most of the fifty-two short, powerful essays that compose this almanac first appeared in Hildebrand’s regular column in Wisconsin Trails magazine. Organized by month, the book charts a year of life in the Midwest: from church suppers, canoe trips, football games, and parades to run-ins with skunks, walleye, and Dobson flies. Hildebrand also reflects on his personal history, investigating the notion of home and the capriciousness of memory. A native Wisconsinite, Hildebrand now teaches at the University of Wisconsin–Eau Claire, and his essays are educational without feeling like lectures. He delves into the history of legendary Midwestern figures like Aldo Leopold, and seasons his text with quotes from authors and poets like John Fowles, Henry David Thoreau, and Katherine Anne Porter. Though his knowledge of the Midwest seems encyclopedic at times, he readily admits his own areas of ignorance. Many essays feature Hildebrand’s friends—ornithologists, evolutionary psychologists, geographers, and tax assessors, to name a few—who provide perspectives that fill in the gaps. The curious, wide-eyed, and occasionally self-deprecating tone of these essays demonstrates Hildebrand’s humility and enthusiasm to know the region more deeply. Occasionally, and perhaps not surprisingly, Hildebrand sounds a little like a Luddite. He blames the Internet for the dearth of small talk in his faculty coffee room, doesn’t trust electronic navigation systems, and argues that fishing has become “a branch of applied electronics.” But these lamentations aren’t exactly nostalgia for the way things used to be. Hildebrand is careful not to glorify the past as a better, simpler time. In the first few pages of the book, he explains his attempt “to be celebratory without falling into the trap of local color where picturesque natives inhabit the Land Time Forgot.” It comes as a relief that he doesn’t portray the Midwest as one big Lake Woebegone. 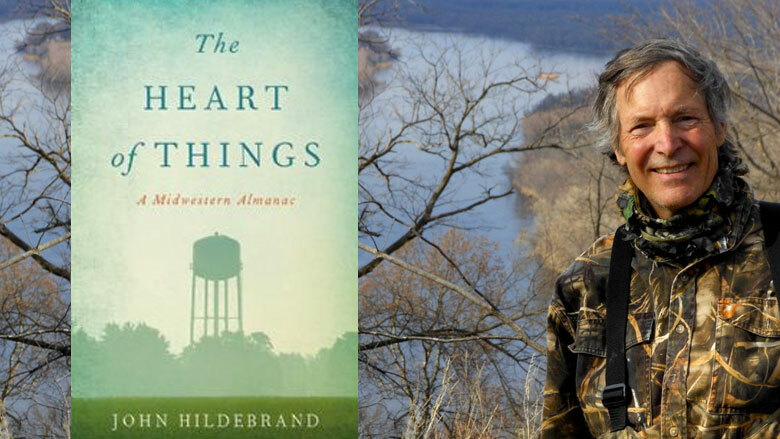 Where The Heart of Things could easily veer into sentimentality, Hildebrand brings his prose back down to earth. In one essay, as he sits at a gathering of old family and friends, Hildebrand thinks: “Every face within the campfire’s glow belongs to someone I’ve known the better part of my life. I’d tell them how much they mean to me except it would spoil the mood, so I crack another beer instead.” Emotional and restrained, humorous and solemn, open-minded and opinionated, this book is as complex and charming as the Midwest itself.